Free! VIN Decoder is able to tell you basic car facts (Year, Make, Model), if you need more try vinlink.com. This report contains only basic car information decoded from the VIN. By using our software or online services you could get much more data then shown below. Each car producer is obliged to give each car is produced a unique number. To avoid collisions these numbers are divided into prefix groups. By knowing these prefix groups, also known as World Manufacturer Identification we can decode who produced the car. 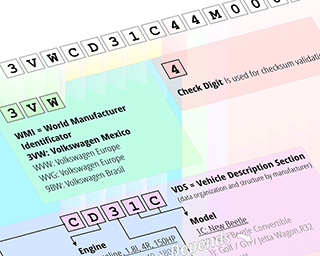 Vehicle Identification Numbers also contain sections related to year of production. The production year is contained inside the number space prefixed with WMI, but various other rules may exists. Most of these rules are specific to each producer. These rules abbreviate information, like production plants, trim levels, driveline, engine and transmission types, all into VIN characters. For 20 years ESP Data Solutions Inc. gathers data, and continues to build databases of vehicle intelligence knowledge. Our databases can be used in various ways. When we discovered that many vehicles have faulty airbags, we offered our knowledge for public safety. We specifically created a website to check for faulty airbags. It was a free service based on our ability to decode VIN information.